Blogging can at times feel like a selfish pursuit. We blog because we enjoy the act, take pleasure from expressing ourselves or feel that we have something relevant to say. We don’t necessarily assume that people will read, but if they do we are delighted and we blog more, bolstered by the confidence that comes from having a supportive audience. There are so many stories out there to be told, and whilst many of us use a blog as an outlet, sometimes those stories are best told elsewhere, where we can’t be recognised, and where we can speak freely without worrying what people will think of us. You may not have a blog, or any form of regular outlet and just need somewhere to let it all out – this is where we can help. We have no idea where this may go, there is no strategy, no agenda. All we can guarantee is confidentiality, a sounding board, a blank page for your words and, if necessary an introduction and conclusion with links or signposts to places where others can find further information or support. You can have comments on or off, seek assistance or just vent. If you’re a regular reader at Battling On please look out for the Blognonymous TM posts and offer the same support and advice that you always have – it’s your involvement that will make this venture a success and I’ve wouldn’t be doing this without you. We have a range of blogs available, with a range of readership and atmospheres. If you’ve got a story to tell and nowhere that you feel able to tell it, feel free to pick one of our blogs where you think you’d feel most comfortable and get in touch. 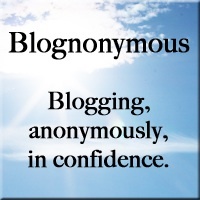 We’re on Twitter too – @blognonymous please follow us and tell your friends – we’d really appreciate your support.